Pallet rack repair is needed in most warehouses and distribution centers due to pallet rack damage from the impact of forklifts and reach-trucks. This pallet rack damage usually occurs at lower levels, leaving most of the upright structurally sound. UNARCO offers Pallet Rack Repair options to fix pallet racking and protect it from rack failures or rack collapses. The pressure to maintain continuous product flow often overrides replacement of damaged pallet racks. Our pallet rack repair option can cut out the damaged areas of the rack and add a cost-efficient sleeve and new post for a more impact resilient solution. In most instances, there is no need to unload the pallet rack. Trained and reliable technicians can install bolt-on pallet rack repair options with specially designed repair kits to fix low-level damage. In many cases, no welding is required. 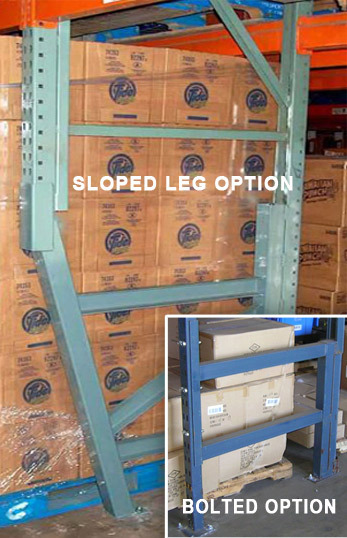 These repair options are adaptable to all manufacturers’ pallet rack. UNARCO’s Straight Leg Repair kits offer special repair kit designs that allow you the convenience of continuing to use bottom beams in the repaired portions. Under trained personnel, welded pallet rack repair kit options can be installed. UNARCO Sloped-Leg Repair Frame, slants the front post inward to give operators additional room to navigate around the post. To further insure rack safety, UNARCO offers a wide range of safety columns that can be field-installed. Rack repair safety is to be taken seriously. Only trained personnel should be used. Let UNARCO show you how easy pallet rack repair is and help you develop a scheduled maintenance inspection program, to ensure pallet rack system longevity and safety. An ongoing program can save money and alleviate costly downtime in any warehouse or distribution center. To see more photos of pallet rack repair visit our Pallet Rack Repair Portfolio or view our Pallet Rack Repair Brochure.